The story opens shortly before Christmas, with Harley on the lam and longing for Joker, who’s still locked in Arkham. The Clown Prince of Crime is bored in stir, and calls Harley with a plan to make his tenure at Arkham more interesting. Next we see Batman taking down an apparently crazed Gotham City councilman who had opened fire at a gun control rally, despite his strong position in favor of gun control. Meanwhile, a Dr. Heinrich Heimlich joins the staff at Arkham and asks to study the Joker. Later, Batman visits with Commissioner Gordon, and learns that eight councilman have been admitted to Arkham under sudden attacks of madness. Back at Arkham, Joker and Dr. Heimlich, who we now know is Harley in disguise, are running rehearsals with other inmates for a Christmas pageant. Heimlich’s methods seem to fly in the face of traditional treatments. Across town, Batman tries to prevent another councilman from suffering the same fate, but the man has a break down despite no apparent external attack. Batman sees the man’s calendar and makes the connection to Heimlich. Batman confronts the doctor and Joker at Arkham. As Heimlich tried to defend the Joker, her pretense collapses under its own weight and she kisses the Joker in front of everyone. Batman chases the clowns through Arkham as other inmates try to stop him. In the end, Harley is infected with Joker’s madness serum. This is not one of the better stories, but it’s not the worst. 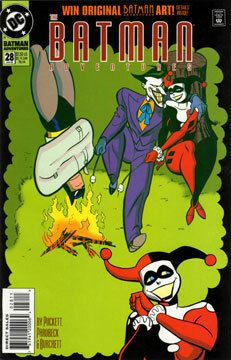 I enjoyed the gimmick of Harley posing as a German psychiatrist, but that’s were my interest ends. The whole issue feels like a long set-up to twelve inmates attacking Bats to the verses of “12 Days of Christmas.” Sadly, the punchline did not deliver. This is not my favorite issue of Parobeck’s either. Oh, his top notch quality is still there, but the layouts were uninspiring. All the backgrounds were flat, bare walls, no matter the setting. And his Joker starts to deviate from the model, with Joker’s chin getting longer every issue he appears in. I do like Parobeck’s interpretation of Dr. Heimlich, and the last panel is excellent (Harley with love in her eyes). I have to point out a major coloring error, though. Dr. Leland is not white! Not really. This could fit in almost anywhere in the timeline. Harley as Dr. Heimlich, but that’s pretty obscure. For Harley and Joker fanatics, probably. Everybody else, maybe save your lunch money.